You're still running the classical 2D-era presentation tools, e.g. PowerPoint or Keynote? 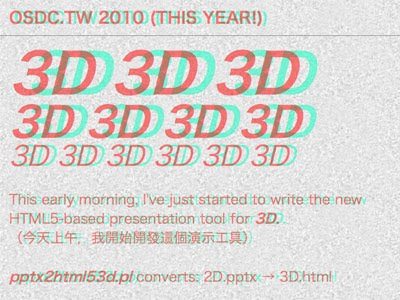 The 3D-era has just come since OSDC.TW 2010. 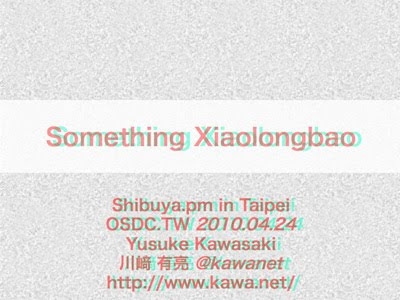 I gave Something Xiaolongbao talk at the most major open source developers conference in Taiwan. At the OSDC.TW day 1 early morning, I wrote pptx2html53d.pl, a Perl script to convert from PowerPoint .pptx file to 3D HTML5 .html. I'll make it open later. Basically .pptx file is a ZIP file. It's pretty easy to parse .pptx using Archive::Zip and XML::TreePP Perl modules. pptx2html53d.pl generates a HTML5 source code. At first, I also used SVG's feColorMatrix feature for 3D. It's however cancelled at this moment as not working well. And also Chrome 5 for Mac seems it could not run SVG's filter element. The slides above are updated as Gugod gave me nice advices around CSS3 usage of text-shadow. Buy 3D glasses in town and enjoy 3D presentation now.